Halwyn Fitzpatrick thinks he's off the hook for attendance at the annual Cotillion Ball. He has no sister to shepherd down the grand staircase this year, and no real desire to go through the rituals of courtship and betrothal himself. Besides, he'll know the right girl when he sees her—especially now that he has new spectacles. But his mother has other plans for him. At twenty-seven years of age, her son is in dire need of a wife. Grace Wagner needs a husband by July in order to inherit the trust her father has left for her. Her stepfather, though, has plans for the money that don't include Grace, and the last thing he wants is for her to find a husband before she turns twenty-one, thereby fulfilling the terms of the trust. She's been in love with Halwyn since she was thirteen, but he hasn't noticed her at any of the balls they've been at over the years. 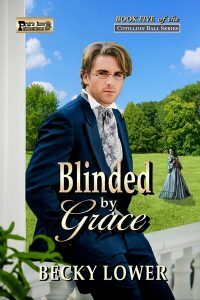 With the aid of his new glasses, he spies Grace from across the room and they share a dance. Grace decides to present him with a business proposition that will satisfy them both. But can a clueless knight in shining armor and a desperate damsel in distress find a way to turn this marriage of convenience into something more?